Perfect for nano or small aquariums. Highest quality design and manufacture. Adjustable output pressure 0-8 bar to meet the needs of any aquarium (20L - 500L). Precision Pisco valve for ultimate dosing control as low as 1 bubble / 10 seconds. Pressure gauge displaying output / working pressure. Solenoid magnetic valve allows for CO2 to be switch on/off at defined times. Connects to nano CO2 cartridges with 5/8"-18 UNF thread (typically 88g and 95g cartridges). Works with any CO2 diffuser. Choice of plug and voltage. 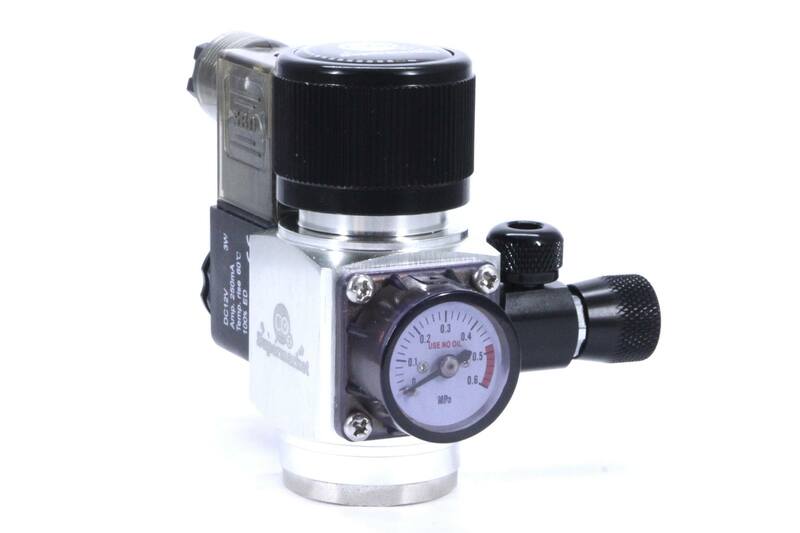 Our Nano CO2 regulator has been designed specifically to meet the needs of small / nano aquariums which typically require lower levels of CO2 dosing. The regulator features adjustable output pressure to ensure it will meet the pressure requirements needed to run the best CO2 diffusers. It also features a high-precision Pisco needle valve which enables incredibly fine adjustment of CO2 dosing as low as 1 bubble every 10 seconds. The integrated solenoid magnetic valve enables the CO2 flow to be shut off overnight when the aquarium plants are not photosynthesising; this means you are not wasting CO2 by dosing when it's not needed, this in turn means your CO2 supply will last much longer and save money in the long-term. You can also choose to upgrade to a 12v DC solenoid (mains transformer included), which provides safe, low temperature, and guaranteed no noise operation. It also has a pressure gauge that displays the output / working pressure, which can be adjusted by means of the pressure adjuster knob. The regulator attaches to mini CO2 cartridges with thread standard of 5/8"-18 UNF (also sold by CO2 Supermarket). Set the output pressure to minimum by turning the pressure adjuster knob fully anticlockwise. Close the needle valve by turning fully clockwise. Screw CO2 cartridge into the regulator. You may feel some resistance as the pin inside the regulator pierces the top of the CO2 cartridge to release the gas. Once the cartridge is screwed in, it should not be removed until all gas has been used. Position the CO2 cartridge in the base/holder. The base has a sticky pad underneath, which can be used to provide additional support if needed. Plug the solenoid into mains plug and switch on. Turn the pressure adjuster clockwise until the pressure gauge reads 0.3 MPa (roughly 40 PSI). This is a good starting point for most CO2 diffusers. It can be increased if necessary. With the bubble counter attached, turn the needle valve anticlockwise to achieve the bubble rate desired. 1 bubble / second is suitable for a 150L aquarium - adjust your dosing in accordance to this, i.e. 1 bubble / 2 seconds for 75L aquarium. This has to be the best small regulator ever made. Worth every penny. If you have any 88g or 95g co2 kit.. Fluval. ista etc. Chuck their nasty little regulators out and get one of these. Adjustable pressure. Very accurate adjustment of co2 output. I won't use any other regulator now. This has to be the best small regulator ever made. Worth every penny. If you have any 88g or 95g co2 kit.. Fluval. ista etc. Chuck their nasty little regulators out and get one of these. Adjustable pressure. Very accurate adjustment of co2 output. I won't use any other regulator now. Exactly what I was looking for for my nano planted tank, and the regulator and 95g cartridge fit perfectly behind the tank so I can keep everything out of sight. Needle valve works great and I'm able to regulate flow to about a bubble per minute, which is exactly the low dosing I was looking for. Exactly what I was looking for for my nano planted tank, and the regulator and 95g cartridge fit perfectly behind the tank so I can keep everything out of sight. Needle valve works great and I'm able to regulate flow to about a bubble per minute, which is exactly the low dosing I was looking for. The one I got first was broken after getting in touch with co2 supermarket they pulled out all the stops and sorted it straight away. Would buy from these guys again. Nice one Martin. The one I got first was broken after getting in touch with co2 supermarket they pulled out all the stops and sorted it straight away. Would buy from these guys again. Nice one Martin. Great service and products as always. Thank you. Great service and products as always. Thank you. Very good quality. Best I've seen. Worth the money! Very good quality. Best I've seen. Worth the money! I got the full kit and it works very well. I got the full kit and it works very well. Such an excellent Nano CO2 specially for my 30L Nano tank. i had trouble with too much CO2 before but now with this controlled Regulator with time solenoid and a precise Pisco Needle valve. i can get 1 bubble per minute or less. Such an excellent Nano CO2 specially for my 30L Nano tank. i had trouble with too much CO2 before but now with this controlled Regulator with time solenoid and a precise Pisco Needle valve. i can get 1 bubble per minute or less.